What do new homeowners and poorly parented adults have in common? They could both benefit from All in Good Time: When to Save, Stock Up, and Schedule Everything for Your Home by Tara Kuczykowski with Mandi Ehman, founders of DealSeekingMom.com, LifeYourWay.net, and now AllinGoodTime.net, which is just a promotional site for the book. (I specify this last point because throughout the book, the authors point readers to AllinGoodTime.net/[some extension relevant to the topic], but when you navigate to AllinGoodTime.net, you learn the whole content of the site is just promotional to the book and for some reason (ad revenue or for simplicity’s sake?) the authors have directed to outside Web sites via their book site). 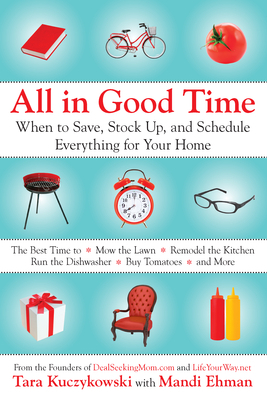 All in Good Time is a good primer for anyone whose mother’s idea of a home-cooked meal was throwing a prefab frozen meal in the microwave or for whose father’s idea of taking care of the lawn meant writing out a check to the gardener once a month. But if your parents actually taught you some life skills, you’re not likely to find much new information in All in Good Time. And in case you’re thinking it might be helpful to just have what you do know pulled together in one place and scheduled – after all the subtitle does promise help with scheduling everything for your home – you’ll be disappointed, if not perplexed, with the book’s organization. The authors go room by room in a typical house, tackling relevant topics alphabetically. For example, you’ll read about Appliances, Cooking Dinner and Dishes in the Kitchen; and Airline Tickets, Batteries and Exercise in the Rec Room. Some of these seem to match right up, but others, such as Alarm Systems and Winter Weather in the Basement, are a bit of a stretch. Fortunately, the Table of Contents lists all the topics by room, but unfortunately, each topic has subtopics that are not listed in the Table of Contents. So to use this as a frequent reference, some unnecessary page-flipping should be expected. But my real complaint about the user-friendliness of this volume is that the scheduling of tasks and when to buy is not charted in an appendix. Each topic/subtopic has pertinent scheduling information, but if it’s March and I want to know, “What should I do this month?” my only option is to sort through the entire book again. For this book to be highly useful to the reader, I would recommend you read it in front of a computer and chart out the recommendations by month, then save each month’s list in your electronic or paper agenda to reference when that time comes. That, in the best of scenarios. But my other sort of gripe about this book is that a great deal of the information in it is not going to be relevant to a great many people. With tips on cutting your own hair, homeschooling, making cleaning supplies from scratch and how to flush your hot water tank, and none of them to the extent that you could put down the book and go do it, it’s just stretched too thin. Clearly there is a proclivity toward the frugal homemaker; but there won’t be much new to the veteran homemaker. In my opinion, this book is most useful to people who are purchasing their own home and have no clue how to maintain it. That’s not to say I didn’t get any benefit out of it. Had I paid full price for the book, it still would have resulted in being a bargain for one tip in particular I took from it: how to make your own foaming hand soap (p.90). And I also learned of a few worthwhile Web sites I hadn’t known about before, not the least of which are the authors’ own sites – both worthy of bookmarking, if not subscribing to. In the final analysis, I would say wait for the second edition, in which, hopefully, the authors will give month-by-month recommendations in the appendix to make this encyclopedic endeavor highly useful to the reader.